CAN MY COMPETITOR LEGALLY SECURE MY PHONE WORD? Unfortunately, yes they can. As there are three to four letters on every number key on your telephone keypad, each Phone Word can translate from 729 to 4096 different words, dual words or word combinations. 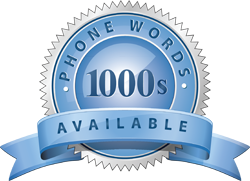 If your brand is trademarked, and your competitor secures the matching Phone Word, they can only advertise the Phone Word in it’s numeric form. They can also lock it away forever ensuring you never gain access to the Phone Word benefits. This practice is definitely not supported by 1300 Easydial, however, due to the Trade Practices Act, we cannot stop supply to any company wishing to secure any Phone Word. 1300 Easydial licenses and sells telephone numbers only, irrespective of what the numbers translate to.